ForeFlight Update Lands in App Store: Plates on Maps, Flight Alerts, and Aerial Satellite Imagery! ForeFlight Mobile 5.3 – our sixth significant release of the year – is now available for download from App Store. The team has put out some amazing updates this year, with a solid backlog of additional features lined up for releases throughout the rest of the year. Plate and taxi diagram map overlays: you can now overlay any of ForeFlight’s own 13,000+ geo-referenced diagrams and 700+ geo-referenced airport diagrams on the moving map. Flight Alerts: when filing IFR through ForeFlight, you’ll be updated when your expected route clearance is available. Then view it directly on the moving map or see your flight track on FlightAware after landing. 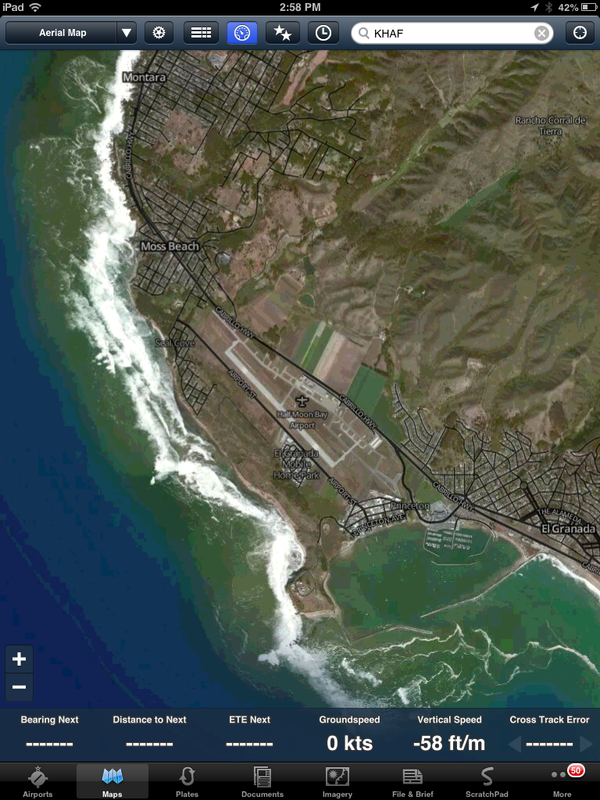 A new Aerial map layer, providing a birds eye view of your route and lets you preview the terminal area. An enhanced instruments panel that shows eight instruments (on iPad in landscape) and has an improved design. Updated direct-connect drivers for Bad Elf and DUAL GPS devices, improving GPS performance and stability. Updated Stratus 2 firmware, which includes an enhancement that improves WiFi and high-altitude GPS performance. Track-up or north-up approach plates! When plates are on the map, you can fly them in track-up forward, track-up centered, or north-up modes. The ability to overlay both internet and airborne ADS-B or XM weather on approaches! Overlay flight rules, NEXRAD radar, and see weather conditions at nearby alternates. Approach plate hazard awareness for terrain and obstacles! If Hazard Advisor is active, terrain and obstacles are colored, raising situational awareness. Traffic information displayed on approach plates! If you have a Stratus or Stratus 2 portable ADS-B receiver and an ADS-B out equipped aircraft, see traffic targets displayed on the approach. Route overlay on top of approach plates! With the approach plate on the map, it is easy to add approach waypoints to your route that line up with the selected approach path. This is part of our ForeFlight Pro subscription, available for $149.99/yr. If you are currently subscribing to the standard package, visit our website to upgrade to Pro. Just make sure to enter the same email you used to purchase your original ForeFlight subscription and you’ll receive pro-rated credit for your upgrade. In addition to these new benefits, a Plate transparency slider is available that, when adjusted, lets you see through to the underlying sectional chart, terrain, or aerial map. One of the goals we set for this feature was fast switching between the currently displayed approach plate and another plate you want to load. This is helpful if ATC changes your runway assignment or if you are training and want to browse through different approaches atop a map layer. We achieved this goal by making the plate interactive: tap on the plate when it is displayed on the map and a menu appears making it simple to select another plate. Once selected, the map will re-center and zoom-to-fit so that you can see the new plate in full. This is an incredible enhancement to situational awareness. On the Airport Procedures view, tap the new “Map” label displayed next to any geo-referenced approach plate. On the Plates view, tap the new Send To button on the top menu and select the “Show on Map” option. In the route editor on the Maps page, tap on any airport in your route and choose either the “Shore Airport Diagram” option, if available, to show the airport diagram on the map or the “Show Plate …” button, which will provide a list of procedures that you can view in full or display on the map. IFR pilots get another productivity enhancer with this release. When you file an IFR flight plan through ForeFlight Mobile, our servers will automatically start listening for updated expected route information. When updated expected route information becomes available, ForeFlight’s servers send that updated route information to all your ForeFlight devices, allowing you to load the updated route information directly into the moving map. We also update the flight plan form, adding the expected route and a link to FlightAware for flight tracking. In the Maps selector you will now find an option for Aerial Map. 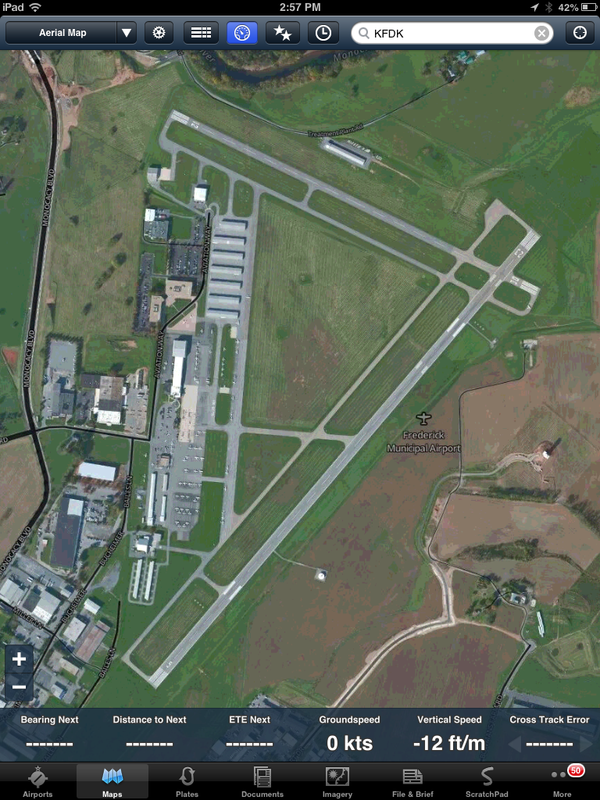 The Aerial Map is satellite imagery of the Earth’s surface, which is helpful for area or airport familiarization before blast off. Aerial Map is also really nice when paired with the new Plates on Map feature. 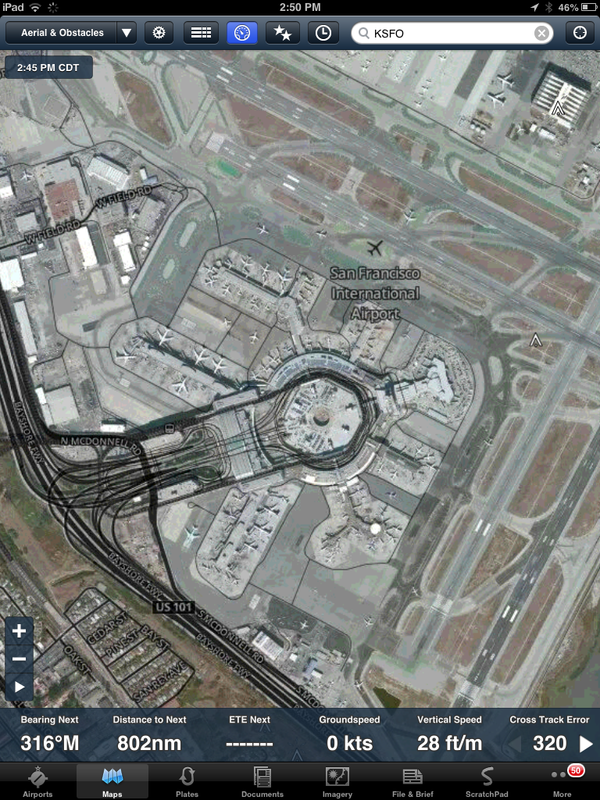 Below is a screenshot of the FAA Taxi Diagram for San Francisco International Airport displayed atop the Aerial Map with some transparency added. It is nice to see the ground features show through. 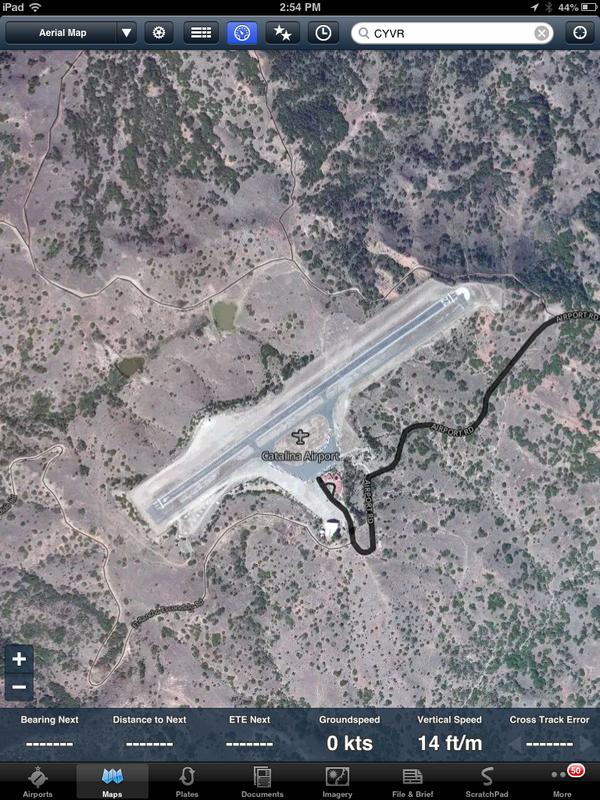 Another screenshot of an approach into Aspen shows how the terrain features line up with those depicted on the approach plate and also shows rain showers on the approach. 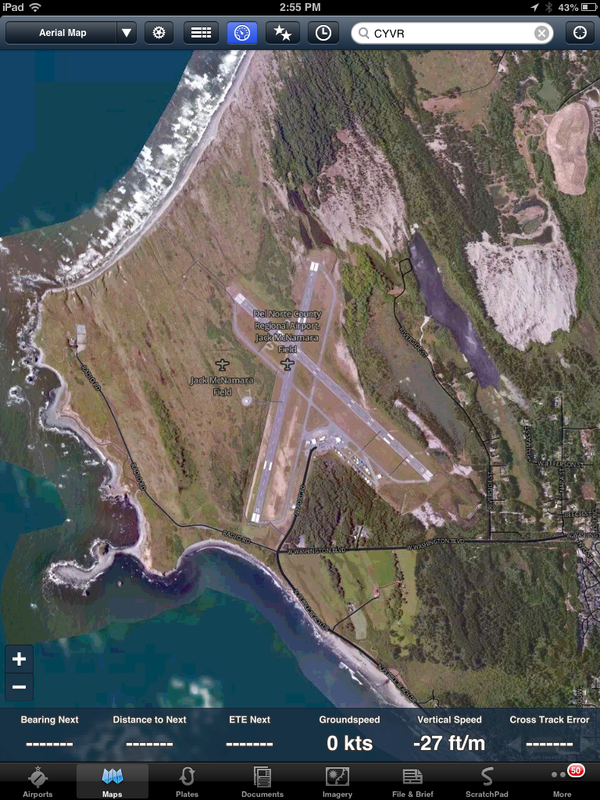 Due to its size, the Aerial Map is only available when connected to the Internet. 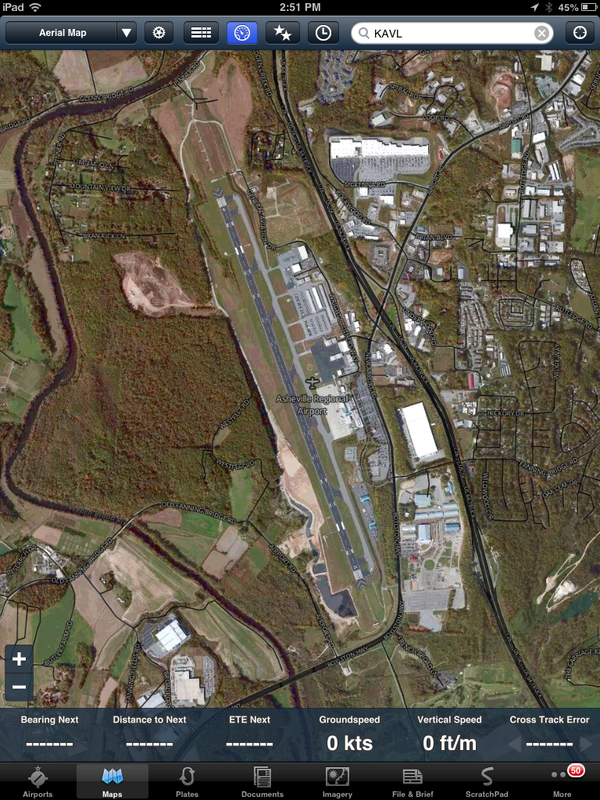 Once you are airborne, you will only be able to see portions of the Aerial Map that you viewed earlier and were cached to your iPad or iPhone. A new tinted bubble design for waypoints that, when tapped, lets more of the map shine through, adding depth. Stratus 1.3 firmware resolving an issue with GPS fixes over 35,000 ft.
VNC improvements in the Toronto area. Bug fixes and performance improvements, especially for iPad 1 and iOS 5.